FIRST INDUSTRIAL VISIT TO KANDHARI BEVERAGES LTD. , SADHUGARH ON 26TH OCTOBER ’17. The Department of Management Studies organized an industrial visit for MBA 1st and 3rd Semester students to Kandhari Beverages Ltd, Nabipur on 26th October ’ 17. 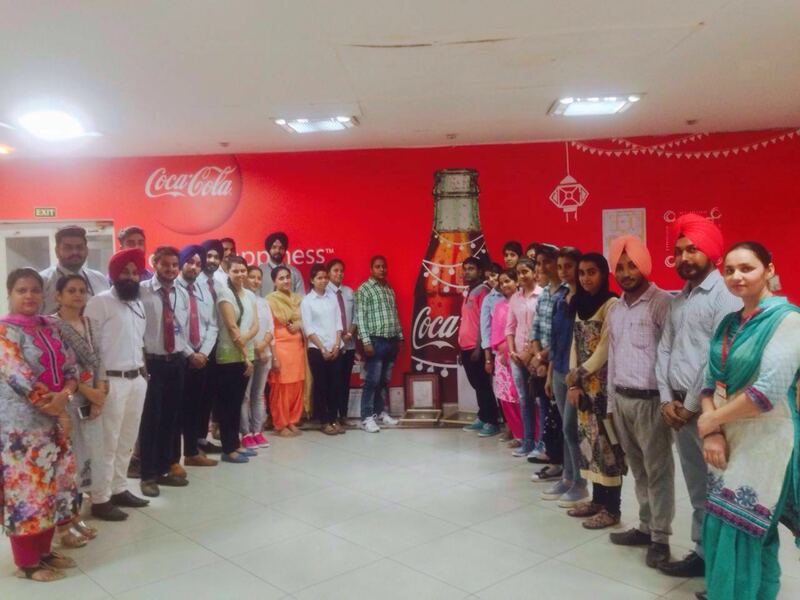 As Coca-cola India, is one of the country’s leading beverage companies, offering a range of healthy, safe, high quality, refreshing beverage options to consumers, its plant located in Nabipur which is a leading manufacturer of cold drinks in North India.Company’s main headquarter is in Chandigarh. Coca-Cola has also two plants in Baddi (Himachal Pradesh) and Saha (Haryana).The plant earlier was setup in 21 acres which later expanded to 28 acres. The plant has Asia’s fastest line of 750bpm, which means the machine packs 750 bottles in one minute. The plant in village Nabipur was established in 2001. The visit of MBA students at the plant was very beneficial. The HR Senior executive Mr. Vipan Kumar guided students about the process and functioning of the machines.The plant mainly manufacture coke, fanta, thumbs-up, and Tatra pack juices. The students were allowed to see all the steps involved in making bevereges from filteration of water to the final step of packing of beverages. The plant’s HR executive also planned an intraction session for the students in which students asked their queries. The staff of the plant was very co-operative and the industrial visit to the plant was very knowledgeable and resourceful. The Department of Management Studies and Photography Club of Baba Banda Singh Bahadur engineering College organized a workshop on Photo-Essays and Stories on 24th August 2017. The faculty and students from various departments participated actively in the session. Mr Jatinder Kamboj, Creative Artist & Professional Photographer at IRIS Academy Patiala interacted with the students in the modern areas of photography by highlighting the importance of photo essays and stories in the field of photography. He shared various award winning photographs as well as discussed the biographies of renowned photographers at the national and international level. He encouraged the students to develop and hone their photography skills and choosing photography as a career option from being amateurs to become professionals. The session was concluded by Prof. Sukhmeet Kaur, coordinator of the event. 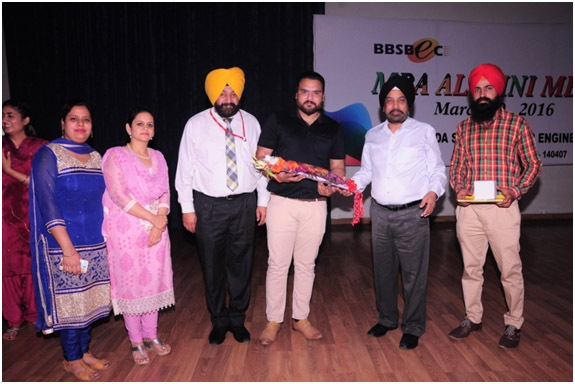 Dr B.S Bhullar, Head MBA, Dr G.S Brar, Head EE and Faculty of Management Studies give a vote of thanks to Mr Jatinder Kamboj for sharing his valuable insights and experience in the field of photography. Freshers’ party is all about making the best start to the new academic year. A time to create everlasting relationships with each other. 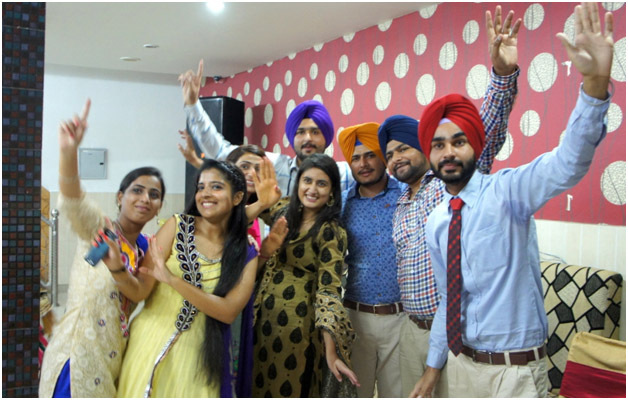 Continuing with the proud tradition of the college, the students of MBA second year have organized a Fresher’s party “FIESTA” to formally welcome the first year students on September 7, 2016 at Hotel Rikkiz, Fatehgarh Sahib. With pulsating ambience, flashing lights and foot tapping music, the party began with a blast. It was a fun filled event at which the fresher’s got an opportunity not only to showcase their talents and but also to interact with the seniors. Dr G.S Lamba, Principal also addressed the students and mesmerized them with their singing. Further, Prof. B.S Bhullar and Faculty MBA also addressed the students and motivate them regarding future prospects. Afterwards, Sanjeev Kumar and Hardeep Kaur was selected as the Mr. 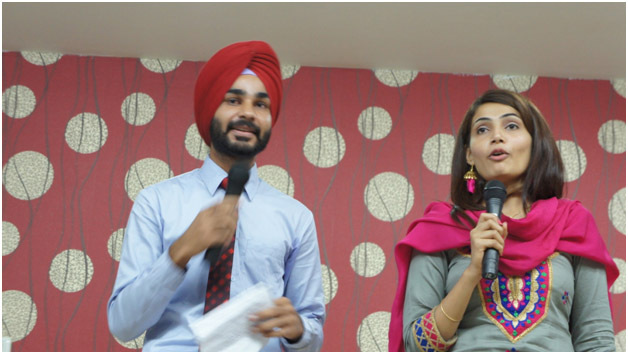 Fresher and Miss Fresher of the Party and Ravi Kumar and Harjit Kaur were selected as Mr. Talented and Miss Talented. Finally the program ended, leaving behind sweet memories that will be cherished lifelong. First Industrial Visit to Kandhari Beverages Ltd. , Sadhugarh on 16th August’16. The Department of Management Studies organized an industrial visit for MBA 1st and 3rd Semester students to Kandhari Beverages Ltd, Sadhugarh on 16th August’16. As Coca-cola India, is one of the country’s leading beverage companies, offering a range of healthy, safe, high quality, refreshing beverage options to consumers, its plant located in Sadhugarh. is a leading manufacturer of cold drinks in North India. Its headquarter is in Chandigarh. Kandhari beverages pvt. Ltd. also setup its plant in village. Sadhugarh distt. Fatehgarh Sahib. The plant earlier was setup in 21 acres which later expanded to 28 acres. The plant has Asia’s fastest line of 750bpm, which means the machine packs 750 bottles in one minute. The plant in village Sadhugarh was established in 2001. The visit of MBA students at the plant was very beneficial. The HR executive Mr. Love Sharma guided students about the process and functioning of the machines. The plant mainly manufacture coke, fanta, thumbs-up, juices. The students were allowed to see all the steps involved in making bevereges from filteration of water to the final step of packing of beverages. The plant’s HR executive also planned an intraction session for the students in which students asked their queries. The staff of the plant was very co-operative and the industrial visit to the plant was very knowledgeable and resourceful. Leaving college for better opportunities in life is not a sad moment, rather it’s a time of celebration, a moment one should always cherish in their memory. One should learn from all the good, bad experiences he/she had in college life. They should gather all these experiences and use it in bright future they are trying to build. In order to bless the seniors with the great future and an incredible party was hosted and organised by MBA-Ist year students, to bid farewell for MBA-IIyear students . The programme started at 12noon with a prayer followed by delivering a few soothing messages by the, Principal, Dr G.S Lamba and Head of the department, Dr. B.S Bhullar. It was a fun filled event and students enjoyed a lot, leaving behind sweet memories that will be cherished lifelong. The Department of Management Studies has been organized a Business Quiz on 12th September, 2014 for its MBA students in order to judge their awareness in the various fields of Management and current business happenings. 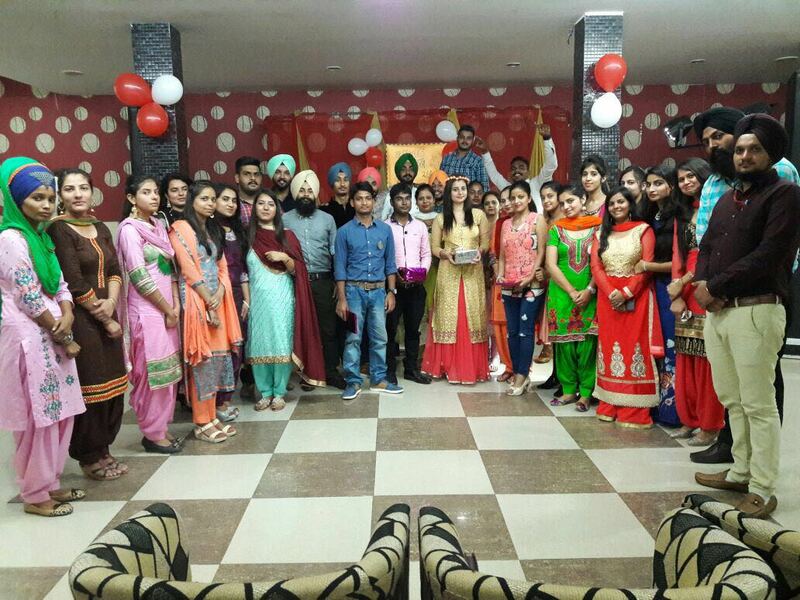 All the students of MBA participated in the event, out of which Jasdeep Kaur and Ramandeep Kaur shared first position. Poonamdeep Kaur and Manpreet Kaur got the second position and Jaskiran Kaur has been awarded with third position. In order to motivate the students for participation , these types of activities will be organized in the near future as well. To honour the students, medals will be awarded in the prize distribution function being organized annually at the college level. ‘hum rahen ya na rahe kal, yaad ayenge ye pal”. 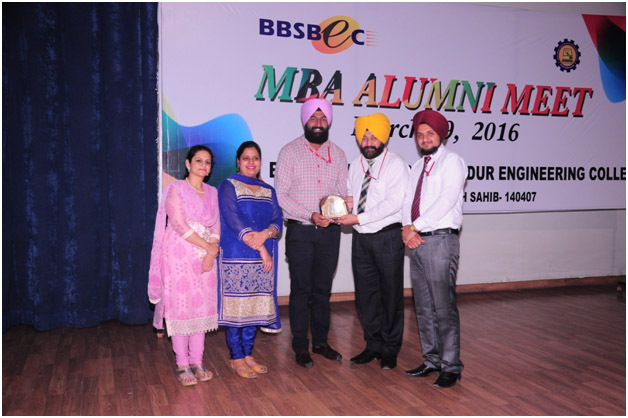 The Department of Management Studies in Association with Alumni Cell of Baba Banda Singh Bahadur Engineering college, Fatehgarh Sahib organized Reunion of esteemed MBA pass out students on 19 march 2016.Principal Retired Major General Dr.G.S.Lamba VSM inaugurated the function. The event started with Shabad Gayan ceremony. 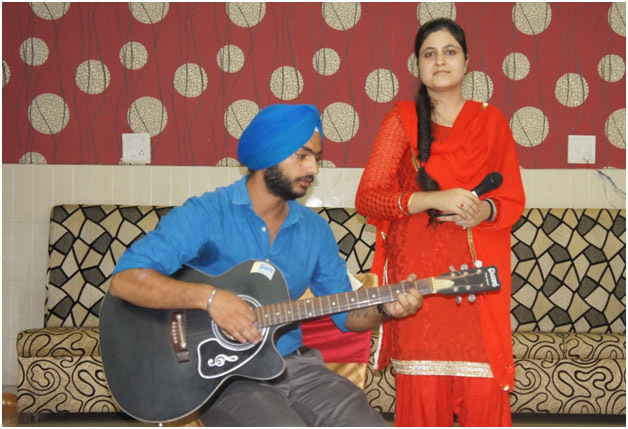 Existing Students of Management department perform various cultural events on this occasion such as Gidha Bhangra and Drama Events. An interaction session was organized between the Alumni members and existing students. The Alumni’s share their views with the existing students and makes them aware how they can plan their career growth in various growing fields after completing their course. 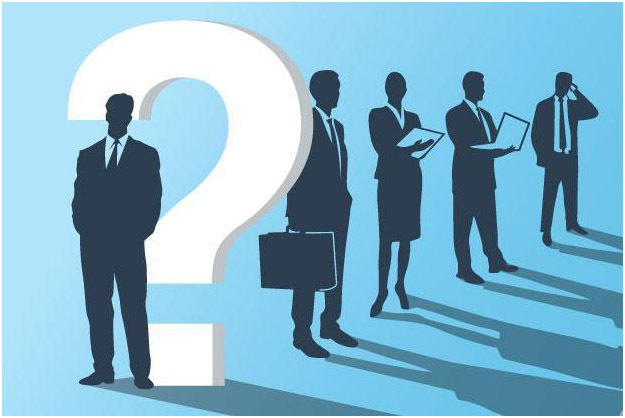 They also share what are the main areas of their personality in which they can develop themselves in order to get a good job. Kulbir Jhinjer proud Alumni of Management Department also rocks the stage by his singing performance and he was honor with college Memento. In order to maintain a long term liaison with Alumni some members are included in Alumni Association of college. Alumni member were feeling wonderful after refreshing their memories at BBSBeC.